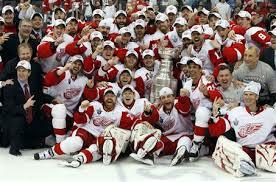 The 1995 Stanley Cup Final NHL championship series was contested by the New Jersey Devils and the Detroit Red Wings. This was the first of nine consecutive finals with American-based franchises exclusively. New Jersey was making the franchise’s first-ever appearance in the Final, while Detroit returned to the Final for the first time since 1966. The Devils swept the series four games to none to win their first Stanley Cup, becoming the sixth post-1967 expansion team to earn a championship.